Let's Do It AnywayTM is a charitable Trust run entirely by Voluntary Trustees, supported by advocates & supporters of the Charity. We are a dedicated upbeat team of people who understands the impact an illness, or disability can have on your life and of those close to you. Our predominant aim at ‘Lets Do It Anyway’ is to promote social welfare and equality inclusion for children and adults of all ages. We aim to provide children and adults with appropriate mobility & specialist equipment, to encourage them to get active, to feel empowered and socially included. We also provide services, or facilities to people who are suffering an illness, disabled or infirm, with the aim of improving their condition of life. We understand the impact these obstacles can have on your life and of those close to you, so together we are raising funds for the public benefit. It doesn't matter how far we go in life, it’s how we get there that matters, so we are determined to help people faced with adversity to get to where they want to be in life and we are doing that with some great events and challenges for everyone. All projects are currently based in Norfolk. If you would like to hear more, or if you are interested in what we do please e-mail us via the contact form for further details. I'm Founder of Charity Lets Do It Anyway and I had been thinking about setting up a charity for sometime as I have been inspired by some amazing people I have met over the years. Many people have suffered from medical problems and many have received life saving organ transplants, adults and children alike, some of whom are sadly no longer with us and were my special friends. The one thing all of these wonderful people posses is a positive attitude, they live life to the full and no matter what, despite medical problems, they have the can-do attitude “Lets Do It AnywayTM”. Hence the name of this charity. After being diagnosed with SLE/Lupus at the age of 14 my kidneys failed. I am pleased to say, I was lucky enough to receive the “amazing Gift Of Life”, in the form of a Kidney transplant on September 7th 1987. 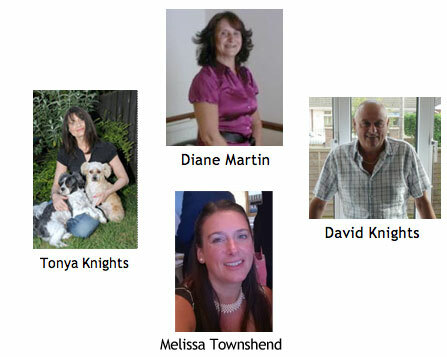 Of which, I could never thank my donor family enough, they are unsung hero’s and are never far from my thoughts. Prior to my transplant, I also had heart and lung problems, which was caused by Lupus and resulted in part of my left lung being removed. I was an athlete as a child, so after my transplant I started training again and in no time at all, I was able to attend Gt Yarmouth Athletic Club once more. Through hard work and determination, I was lucky enough to represent UK in athletics at the World Transplant Games on several occasions in Singapore, Hungry, Canada & England and won a variety of events. Throughout my life I have always been positive, self motivated and I always thrive on a challenge. With this in mind, I have tried many sports and activities, also adrenaline related sports, including white-water rafting, rock climbing, abseiling, solo sky diving etc. In 2010, I was told I had cancer and in June I had an operation to remove the non moving lump, followed by a course of radio therapy in September. I was so lucky to discover the lump very early, which meant that I didn’t need to have chemo therapy. 2010 was a tough year, but throughout the years, when faced with adversity, I have become more and more determined. 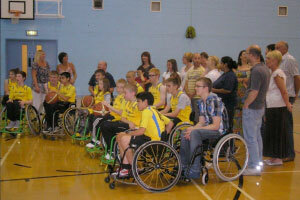 The events of 2010, have certainly spurred me on to set-up the charity I have been thinking about for a long time. I am proud to say, we now have a charity with five Trustees, and our goals are completely transparent, which means you will always know where your money is going when you make a donation. 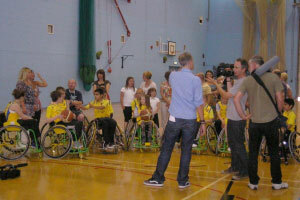 Our aim is to raise funds to complete projects to help people overcome adversity in the community, to promote Social and equality inclusion for children and adults with a disability or debilitating medical condition with the aim of improving their condition of life by completing projects for worthy causes, currently in Norfolk, although our aim is to carry-out projects all over the UK. 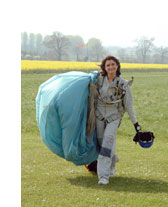 ...We are raising funds with great events and challenges, so come on...Lets Do It AnywayT! Meet Sharon our fabulous Advocate for Norfolk. She raises awareness, host fundraising events and promotes 'Lets Do It Anyway' whenever she can. 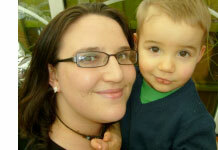 We are very proud to have Sharon on board as a dedicated advocate. 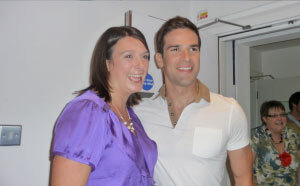 Gethin Jones meets his biggest fan, Melissa! “Holding Out For A Hero”. Lets Do It Anyway were lucky enough to be approached and subsequently one of twenty one charities chosen out of 500 from across the UK, to appear on a brand new prime time game show for ITV1, Holding Out For A Hero. Hosted by Gethin Jones, contestants don’t play to win themselves a prize, they play to win a sum of money for their hero’s cause. Three contestants play, each hoping they have the right combination of skill, luck and strategy to win. Unlike on any other quiz show, these contestants are playing to make someone else’s dream come true. Whatever money they win, they will be handing over to their hero –a deserving person with an amazing story who has no idea someone has decided to play for them. We were on the 2nd show of the new series, which was aired on Sunday 18th September 2011, with Jinny Proctor as contestant doing her best to win for Lets Do It Anyway. I was also on the show as Founder of the charity (Tonya Knights). I’m so happy to say, that although we didn’t come in first place, we went away with £3000 for the charity. This was an amazing platform to let more people know about our new charity Lets Do It Anyway. A huge thank you goes out to all friends and family for going to support Lets Do It Anyway on the show, also to everyone involved in the surprise during the filming of the reveal, particularly all member of the Norwich Lowriders Junior Basketball team, parents & coach Nick Jarvis. What a privilege to be invited on to a show with so many great causes, with such inspirational stories. 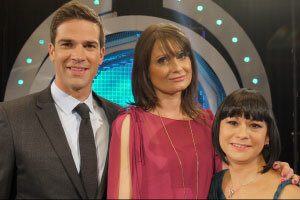 www.itv.com/hero Norfolk charity to be on ITV1 game show. Audio File: Lets Do It Anyway is a new charity that needs volunteers.